The Pulsed Ruby Laser is similar to the ruby cavity maser, to some extent, in that stimulation is applied to raise the chromium atoms to a higher energy level to secure a population inversion once again. However, this time pumping is With light, rather than with microwave, energy. Also, no magnetic field is required to modify the existing energy levels because these are already suitable for laser action. The cavity is also different, as can be seen from Figure 12-39. This shows that two parallel mirrors are used, one fully silvered and the other partly so, to enable the coherent light radiation to be emitted through that end. The mirrors must be parallel to a high degree of accuracy and must be separated by a distance that is an exact number of half-wavelengths apart (in the ruby, at the desired frequency). Such an arrangement is called a Fabry Perot Resonator. The spiral flash tube pumps light energy into the ruby in pulses, which are generated by the charge and discharge of a capacitor. Cooling is used to keep the ruby at a constant temperature, since quite a lot of the energy pumped into it is dissipated into heat, instead of being radiated as coherent light. Although this cooling also helps laser action, as it did with the maser, room temperature operation is normal. Pumping raises the electrons to a high energy level, different from that which operated in the maser, since the photon energy is now much higher, because of the higher frequency. Electrons so raised in energy may fall back either to the ground state, emitting uncoordinated radiation, or else to an intermediate level, as a large number of them do. The energy they lose in the process appears in the form of heat and/or fluorescence. The intermediate level is quasi-stable; electrons remain at it for a few milliseconds, which corresponds to the pumping period. Then their energy rapidly falls to the ground level, with ensuing radiation at the desired frequency. The energy discharge from some of the chromium atoms triggers and coordinates the discharge from the others, with a resulting correct phase relationship of all the photons radiated. A large number of these may not escape through the cylindrical sidewalls of the ruby. However, the photons traveling longitudinally are reflected from the silvered end walls and travel back and forth, triggering off other atoms. In this fashion energy builds up, until it is sufficient to escape through the partly silvered end wall, in the form of a very intense short pulse of coherent light that is almost completely monochromatic (i.e., single-frequency). The ruby crystal is now in its original state, ready for the next pumping pulse from the flash tube. The beam of light leaving the ruby crystal is very narrow and almost parallel, with a divergence of less than 0.1°. The frequency spread, or line width, is also very small, of the order of about 1 GHz at a center frequency that is roughly 500,000 GHz (or 500 THz). However, the efficiency is poor (in the vicinity of 1 percent), so that pulsed operation is preferable, in order to permit the dissipated heat to be removed before the next pulse. Cooling also helps, and liquid nitrogen is sometimes used for this. If the chromium doping of the ruby is increased, CW operation becomes possible. The output level is then only milliwatts instead of the megawatts of peak power avail­able with pulsed operation. 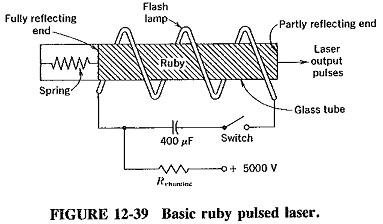 It is possible to shorten the pulse duration, without altering the average power output of the Pulsed Ruby Laser, by the process of Q-spoiling, whose effect is to intensify the peak radiated pulse power. In this process, also known as Q-switching, one of the ends of the ruby rod is made transparent, and the other is left partly silvered. A mirror is situated behind the unsilvered end, with a shutter placed in front of it. The shutter is closed during pumping, thus preventing laser action and “spoiling” the Q of the Fabry-Perot resonator. This has the effect of greatly helping the population inversion and permits an even larger number of electrons to be situated at the intermediate level. The shutter is opened at the end of the pumping period. With the second minor now in place, oscillations build up extremely quickly and produce a most intense flash of very short duration; peak powers in excess of 1000 MW are possible. Two other points should now be raised in connection with solid-state lasers. The first is simply that the laser is an oscillator, unlike the maser. The second is that solid-state lasers are not restricted to using Pulsed Ruby Laser, and other materials have been used to produce other wavelengths. These substances include neodymium, glass doped with gadolinium and the plastic polymethyl methacrylate doped with europium. The last requires ultraviolet pumping and produces a deep crimson light.